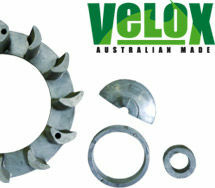 Velox Products is an Australian, family owned company that has been involved in the manufacture of products and castings since 1935, specialising in aluminium and its alloys and being capable of Pressure and Gravity diecasting methods. We comply with Quality System ISO9001, a respected standard for Australian Manufacturing. We have the experience and equipment to produce castings in either method to suit your requirements. We can help with the design and manufacture of tooling to suit your needs at competitive prices. We invite your inquiry and assure you of our attention and service. Check out some of our handiwork at Velox Products. We supply all of the castings for this Australian manufacturer, including letterbox fronts, grates and boat trailer wheels.